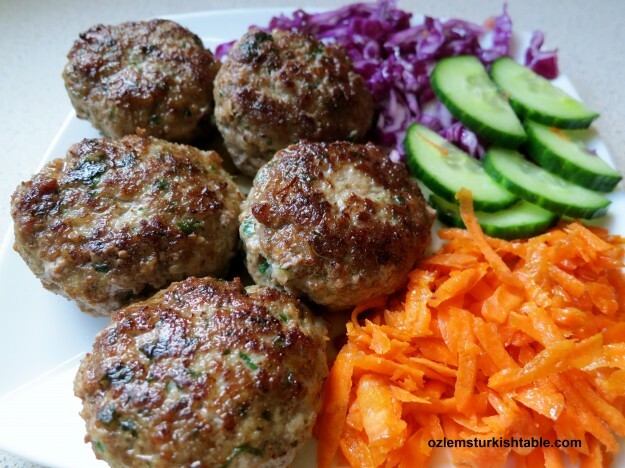 Homemade Turkish meatballs; a childhood favorite; delicious with grated carrot & red cabbage salad aside. 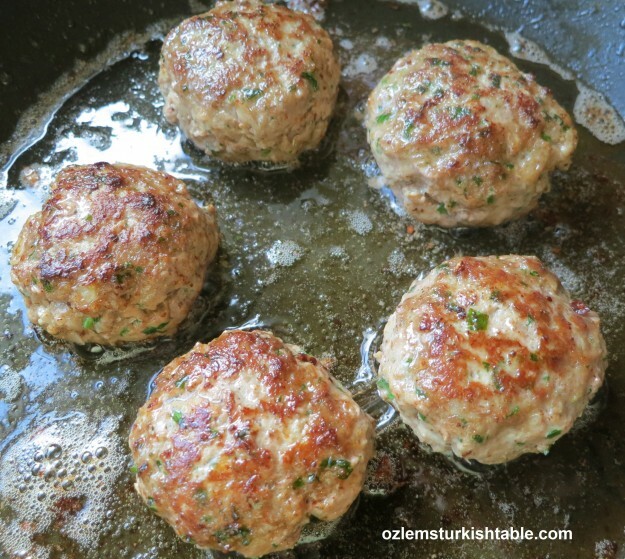 These homemade Turkish meatballs are one of my childhood favorites; my mother would always keep some in the freezer ready to cook instantly and the delicious aroma greets you as soon as you are home. For me there is nothing quite like homemade meatballs, our koftes. 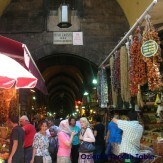 Historic Sultanahmet Koftecisi; they have been making delicious koftes for almost 100 years. We Turks love our koftes, Turkish meatballs. Almost every region in Turkey has their own specialty of these meatballs. One of my favorite type is the Sultanahmet Koftesi prepared by the historic Sultanahmet Koftecisi; served with fasulye piyazi, delicious beans salad with red onions and sumac aside; they have been making these delicious Koftes in Sultanahmet, Istanbul for almost 100 years. Izmir kofte; Turkish meatballs with potato, peppers and tomatoes; simply delicious. 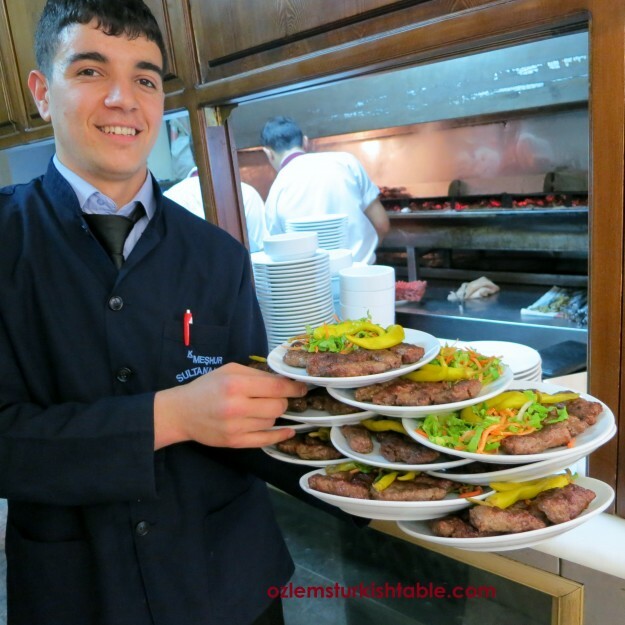 How about the melt-in-the-mouth Izmir Kofte? 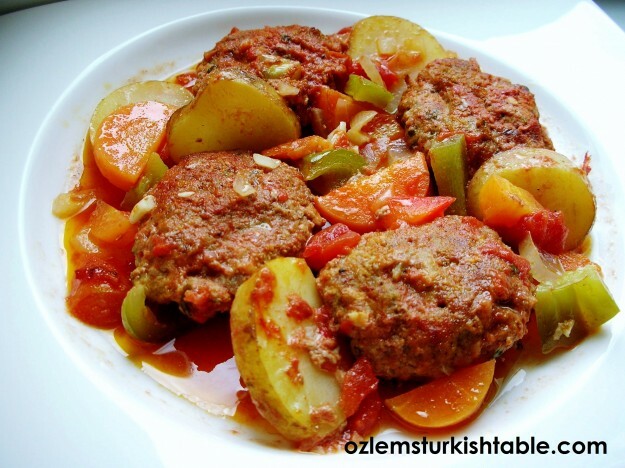 Here the Turkish style meatballs are cooked with tomatoes, peppers and onions in a delicious tomato based sauce. A delicious, complete meal you can prepare ahead of time. I like to have half & half mixture of ground beef and ground lamb in my meatballs; you need at least about 25% of the meat content as ground lamb for that delicious, melt-in-the-mouth meatball taste. Our koftes have quite a generous grated onion in it, as well as parsley, stale bread, 1 egg and salt & ground black pepper seasoning. My mother includes a generous amount of stale bread crumbs in the mixture and that makes koftes taste wonderful and moist. Mix the ingredients (except the meat) first; that softens the onions and the mixture blends with the meat better. Make sure to rest the shaped meatballs in the fridge for about 30 minutes or more before cooking, that helps the meatballs and flavors to settle. If you are a kofte, meatballs fan like we are, make a double batch and freeze half of the shaped but uncooked meatballs in the fridge. You can layer these meatballs in a container and put cling film between each layer, so that they don’t stick together. Just make sure to remove the cling film before cooking. A great tip from Semsa; cook one meatball on the pan or grill first to check the seasoning. If they need more salt or pepper, add some to the rest of the meatballs. Good seasoning is essential. 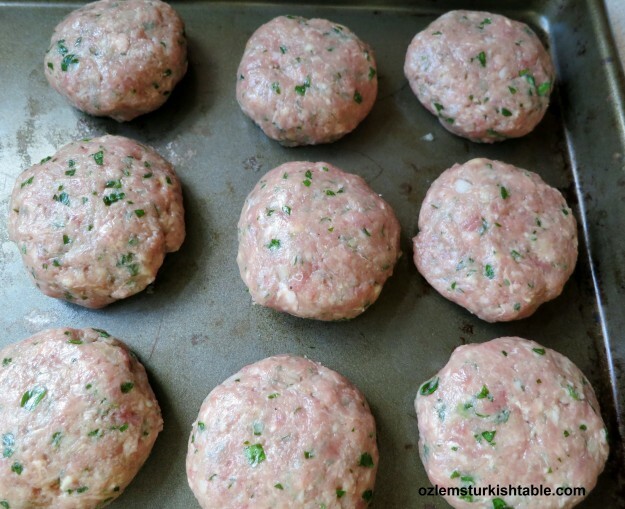 Kofte, homemade Turkish meatballs, a favorite for the children and adults. 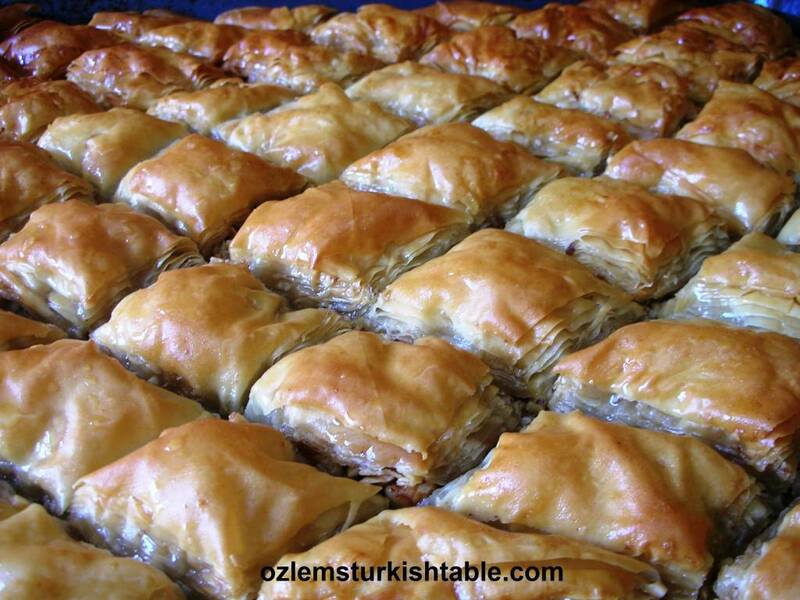 Turkish cuisine is a feast to all senses; healthy, family friendly, great for entertaining too. 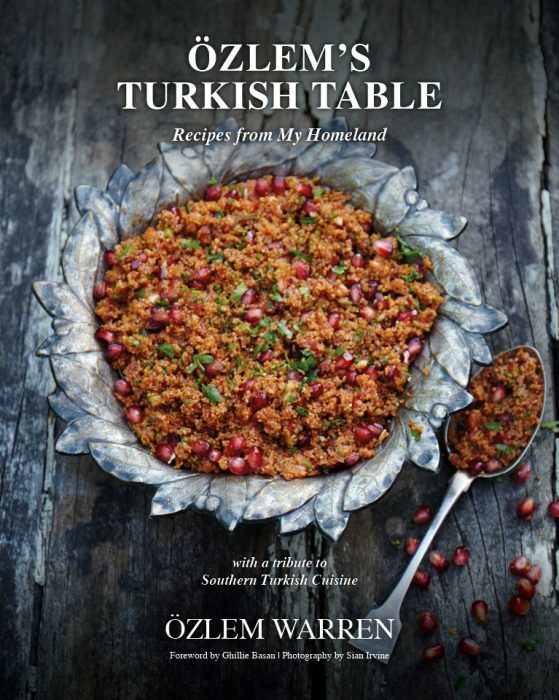 I have included over 90 authentic Turkish recipes at my cookery book, Ozlem’s Turkish Table, Recipes from My Homeland. 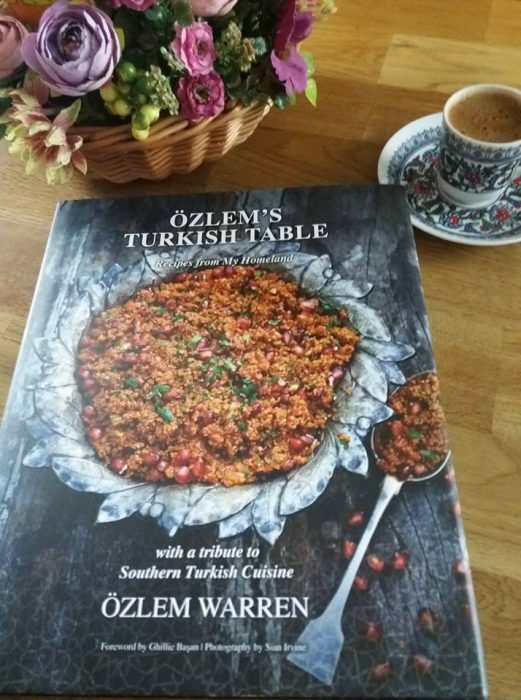 Signed copies of Ozlem’s Turkish Table can be ordered at this link, it is delivered promptly, worldwide. Kofte ingredients; first mix all except the meat well. Soak the stale bread slices in a small bowl of water then squeeze them dry. In a large bowl, combine all the kofte, meatball ingredients except the meat and knead well. That will help soften the onions and blend the ingredients homogeneously. Stir in the ground meat, season with salt (about 1 – 2 tsp.) and ground black pepper to your taste. Knead for a good 3-5 minutes with your hands, until the mixture becomes elastic and mixed well. Cover this mixture with a cling film and rest in the fridge for at least 30 minutes. Place the meatballs in a tray ready cook side by side. After 30 minutes or just before cooking them, have a bowl of water next to you and start shaping the meatballs. First wet your hands and take a small tangerine size of the meat mixture and roll into a ball. Slightly flatten each ball with the heel of your hand. Place the meatballs in a tray ready cook side by side and continue until all the meat mixture is shaped into meatballs. Sizzling, delicious koftes, Turkish meatballs. Heat a thin layer of olive oil in a wide, heavy (preferably non-stick) pan and place the meatballs, 4 -5 of them at a time. Cook for about 6 -8 minutes (3- 4 minutes each side), until cooked and browned on all sides. Alternatively, you can grill them until brown both sides. Remove the meatballs with a slotted spoon and drain on a paper towel. Home made kofte, Turkish meatballs, ready to enjoy! Serve the meatballs hot with this refreshing grated carrots and red cabbage salad by the side. Cacik dip of diced cucumber in yoghurt with dried mint would go also really well with these delicious meatballs. This crunchy, vibrant salad is popular served in lokantas as well as kebab houses in Turkey and accompanies grilled meat, fish and vegetables deliciously. It is simple to make and the refreshing lemon juice and the sharp balsamic vinegar dressing pair greatly with the carrots and the red cabbage. 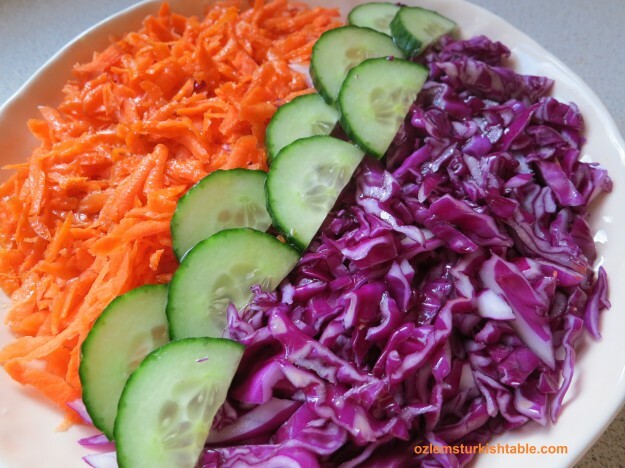 Vibrant, refreshing grated carrot and red cabbage salad with sliced cucumbers. Remove the tough outer leaves and the middle hard part of the red cabbage. Halve the cabbage and slice thinly. Place the sliced cabbage in a bowl and stir in the balsamic vinegar, salt and the pepper; using your hands to knead well to soften them up. If you have time, cover and keep this marinated cabbage in the fridge for a few hours before serving, for all the flavors to blend in. This salad keeps in the fridge for a good couple of days and it will taste even better the next day! Place the grated carrots in a bowl and drizzle 1 tbsp. extra virgin olive oil and the lemon juice over. Season with salt and pepper and mix well. Place the dressed carrots and the cabbage side by side on a serving dish. Add the sliced cucumbers and drizzle the remaining olive oil over the cabbage and cucumbers. Serve the salad with your meatballs or grilled fish or vegetables. 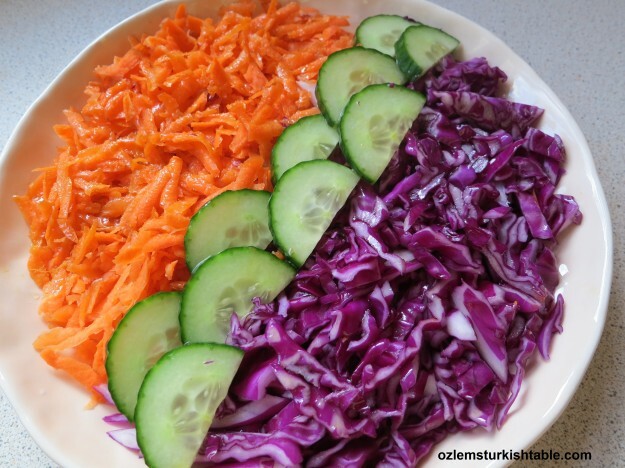 Havuc ve kirmizi lahana salatasi; grated carrots and red cabbage pair well with balsamic vinegar, olive oil and lemon juice dressing. these look so good! i will be making them soon! thanks for another wonderful recipe! I wished you were next door and we could share 🙂 Both the kofte and the carrot & cabbage salad is so easy though, I am sure yours will be delicious:) thank you for stopping by! 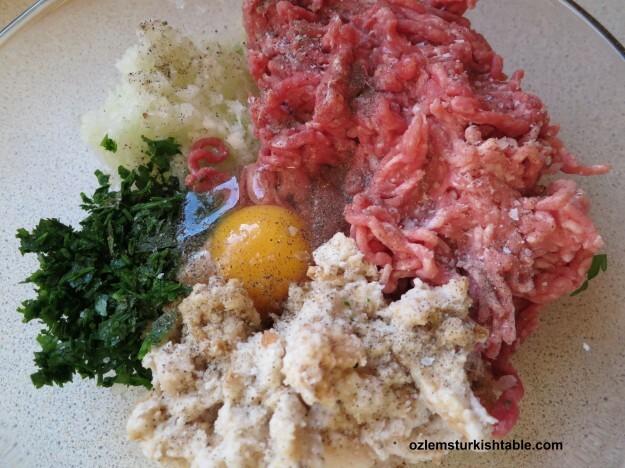 Özlem, You really won’t believe this but we have agreed to lead making a big dinner for about 40 on Heybeliada in the wintertime featuring köfte!! You always seem to come to the rescue when needed. We will be testing out various recipes between now and the dinner so this will be one of our first. Thanks! 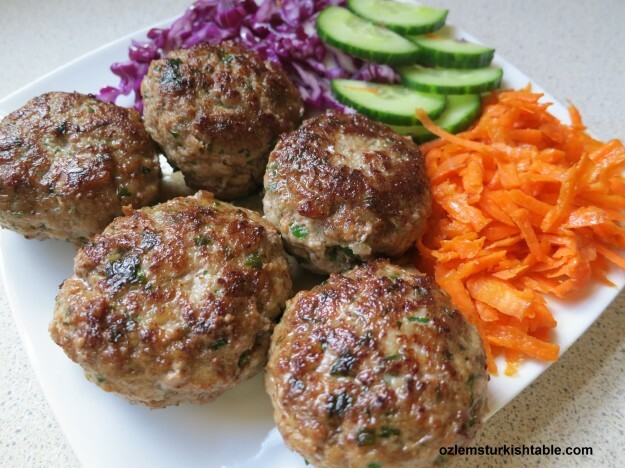 The kofte look decadently moist and mouthwatering, Ozlem:) they use a similar ground meat and onion mix to the Indian Seekh kebab…& as always, I’m delighted with our common lingo, in Indian food, kofta is a grated vegetables round, generally fried:) this yum recipe is a must try! XxPeri. When we lived in England, we made sure to cook these meatballs once a week to keep our tastebud ties to Turkey. These look so tempting. Great set of tips for making the best meatballs. I totally agree about checking the seasoning by cooking one first – it can make such a difference. I am with you Julia, kofte and piyaz are a match made in heaven :)! Mouth-watering, indeed! I guess I shouldn’t have looked at these while waiting to go to lunch! This is the perfect time of year for wonderful comfort food. Thank you Susan, we all love a good kofte, meatballs I think, it is a special comfort food for me too – thanks for stopping by! Your kofte looks delicious as usual Ozlem but wow that salad made my mouth water. I bet it was delicious! I have some Turkish spices from the market when we were in Istanbul. How do I substitute that in this recipe? Hello Cheryl, this meatballs recipe only has ground black pepper as a spice. Depending on which region, we have many varieties of meatballs. Not sure which spices you got from Turkey but red pepper flakes, cumin also goes well in the koftes, hope this helps. If I wanted to cook this in an oven instead of frying it… How long would I have to cook it and what temp. should it be on?? 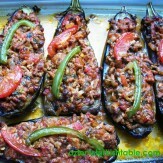 Merhaba Febin, in that case I would bake them at 180 C/ 350 F for about 25 – 30 mins, until they’re golden brown – afiyet olsun! 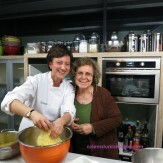 Hi Ozlem – love your website and your recipes. What’s the difference between using stale bread as opposed to bread crumbs? Also is stale bread better than fresh bread? Hi, many thanks for stopping by, glad to hear you are enjoying my recipes here, thank you. Stale bread is less moist and holds the meatball mixture together much better than fresh bread. You can also use bread crumbs, though you may need a little water to bind them all together. Hope it helps – afiyet olsun! Merhaba Ozlem! If we wish to use dried bread crumbs, how much would be sufficient for 16 oz of meat? Merhaba Cali, about 1/2 cup – 45 gr bread crumbs should be sufficient, afiyet olsun! Do you make the breadcrumbs before you soak the bread, or do you soak the slices of bread an then as you mix in with the other ingredients it will just fall apart anyway? Hi Sarah, I soak the bread slices then squeeze the excess moisture and crumble to the mix, it works well – hope you enjoy the koftes! I was in Izmir on business and had the meat balls. Wonderful! Ima Tully took photo’s in the outside kitchen of the grilling of meatballs and peppers. They joked that I would go back to America and start cooking their meatballs. Fun time. Great food, great people. I also had a dish of very small bits of lamb and beef on skewers. They were small so they served about 20 or more to me. The chef came to the table and mixed spices and showed me how to roll the skewer in the spices. Wonderful. I am not sure of their name. I thought it something like chercitz. I was told the place I went to is out in the country and no tourist go there. In fact the owner/chef had my business associate from Turkey take our pictipur urge in front of a portrait of Attaturk. Great experience, against great people when not in tourist area. I have made these a dozen times! Sooooo yummy!!! Thank you Turkey for sharing the recipe for meatballs with a Swedish king centuries ago. Everyone thinks that Swedish meatballs are a Swedish food, when it really isn’t. And to think I have been eating this meatballs all my life, and never knew their origin. Neither did the rest of the world. Leave a Reply to Barbara Click here to cancel reply.